Mybet Casino bonus money is an enhancement that draws a bevy of players here over and over. 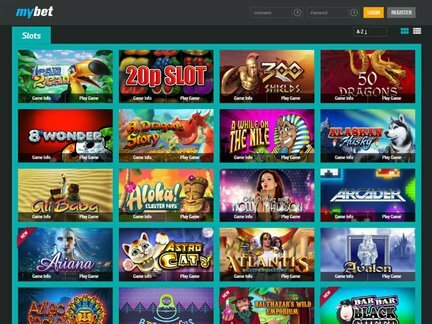 With some research into their monthly promotions offered, you may be able to find coupons and no deposit bonus codes to play some games with free money. Currently, all new players are welcomed with a 200% match bonus up to $200 plus 100 free spins, which will be automatically credited to your casino account. The free spins can be used towards the Taco Brothers slot. The best part? There are no turnover conditions for the winnings resulting from the free spins! So simply deposit as little as €10 and you will receive your 100 cash free spins on top of your first deposit bonus. After the welcome, the bonus opportunities don't stop. Mybet casino comes up with new vouchers, promos, and coupons regularly, so keep checking back to see what is new. There are currently no mobile app opportunities for your iPhone, iPad, or Android devices. This casino is more focused on the live games which they offer to players, but perhaps they will offer mobile apps in the future. You can compare Mybet Casino to casinos like Exclusive Bet, and find that it holds up quite well. 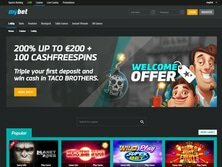 In fact, Mybet offers over 3 times the amount in welcome deposit match money that you can find at Exclusive bet, and you can also get 5 free spins on one new slot machine every week. With the new offers that appear each month, you will find great game enhancement whenever you wish. This casino is especially popular in European countries. Germany is now the country in which this casino has the highest popularity. France previously came in at a close second, but that was before French players became restricted. The restricted countries include USA, France, Malta, Belgium, Poland, and Bulgaria. They do offer the site in several different languages, to support the many other countries which enjoy playing here. Net Entertainment is the software that powers this casino, and they offer many categories of games. Some of these include roulette, blackjack, slots, video poker, table games, and jackpots. Some of the favorite games here include Wild Water, Gonzo's Quest, Wonky Wabbits, And Golden Shamrock. But the biggest draw to Mybet Casino is the live game options. There are many jackpot games here, in many fun and amusing themes for your thrill and entertainment. Some of these jackpot games include Icy Wonders, Fishy Fortune, Super Lucky Frog, Gold Rush, and more. Some of these have climbed to impressive jackpot totals over €25,000, which draw in players by the hundreds. The best way to watch these climbing jackpots and get a chance to win is to play. As with any site that provides a service, this casino has received some customer complaints. These have often dealt with bonus funds confusion, or difficulty withdrawing money, and each time the casino works hard to handle these in a way that leaves customers satisfied. Mybet Casino offers compensation to any players that deserve it, and don't leave any complaints unresolved. You can reach customer support by email, phone, and even a live chat option. They can also help people in several different languages, to make gameplay and site operation as user-friendly as possible. Personal Exchange Ltd. owns the casino, and established it in 2003. It is an instant play site licensed in Malta, which is an area well known for strict and safe gaming regulations. They use Net Entertainment software to power their games, and this company introduces new periodically to keep players interested and challenged with new options. They also enjoy offering players a live gaming experience, which is different from many other online casinos available. Mybet Casino bonuses were easy to obtain, especially after the quick sign up process. I was sad to see that they didn't offer any mobile app options for iPhone, iPad, or Android devices, but the instant play option was fast, easy, and fully functional. I was able to use some free spins on great slots games, and found some great coupons and bonus codes too. I will look for a no deposit bonus code in future play sessions here, for some great free play. It was also very interesting to try the live casino games. I rate this casino at a 3.5, for good bonus options and an easy to navigate site. My friends will definitely get a recommendation from me to play here.